My ’05 MINI has had the (dealer installed) AUX socket since day one and until recently it has always worked just fine. But the last few trips I’ve tried to use it I’ve had problems, and yesterday it was pretty much useless. The music will play just fine and then it will abruptly stop. The iPhone is still playing but the radio on the MINI is no longer saying AUX and when I rotate through the choices AUX is no longer even available as an option. The fix is to remove the audio cable from the iPhone and plug it back in – the AUX option reappears. In traffic, this is quite the cumbersome thing to do so that’s pretty much it for my music listening. It’s a bummer as sometimes there’s something I want to listen to, rather than the regular XM radio. I suspect the fault lies with the AUX adaptor but we’ll find out fairly soon as in May I am ditching the iPhone and will be going Android. The iPhone is a great device and I am sure I will miss it, but I’m no longer willing to put money into the ever-increasing dictatorship that is Mr Jobs – what next, demanding I can only use your devices while wearing a black turtleneck? Oh, and I really can’t stand AT&T anymore either. While in San Diego, I park my MINI in various locations near the apartment I rent, sometimes right outside but other times it’s a half to a full block away. Last Thursday evening I parked almost right outside the entrance, clicked the key to lock the doors and there was nothing. I walked right up to the car, tried it again and still nothing. So I went inside, read about key fobs failing, expensive replacements, new rearview mirrors etc. Next day I go down to the car and sure enough I still can’t open the car remotely. Open it old school and drive to work. Thinking that maybe the key had taken a charge on the short drive I tried locking it remotely and it worked. Pleased that I didn’t need a new key I thought no more about it until I had to go back to the apartment to pick up my Dad. I end up parking in the exact same spot I had left in the morning, get out of the car, go to lock the door and, dammit, nothing. Again, I cannot lock the door remotely. Go in, pick up Dad and drive home. Get home and the key works fine. All weekend the key works fine (but the car was making some odd nosies that I need to investigate). Worked fine when I got to work this morning. So, I’m about to go to the apartment. Will the key work? If not, is there some electrical field nearby that is blocking the signal for that one-two car lengths? Is that even possible?! It’s odd, very odd. 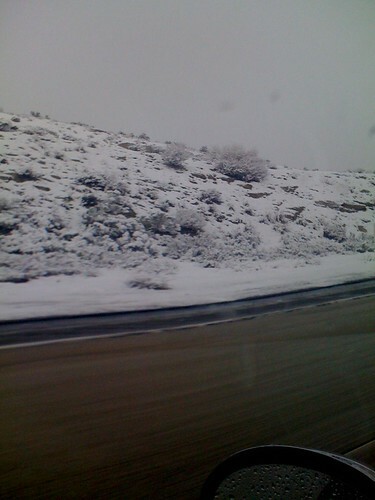 This is April in SoCal? It’s April 1st but this is no joke! On my way into work this morning from home (I was in Vegas for the first part of the week, but not at AMVIV) there was lots of snow on the ground in the mountains, and for about 10 minutes I was driving through it as it was coming out of the sky. First time, I think, that this MINI has been in the snow. Temps got down to 32F and the OBC flashed at me but didn’t ping like my ’02 MCS did so I might not have noticed the ice warning otherwise. Odd. My Dad is here and couldn’t believe he was in the southern-most part of CA in April in the snow – he could have stayed at home! 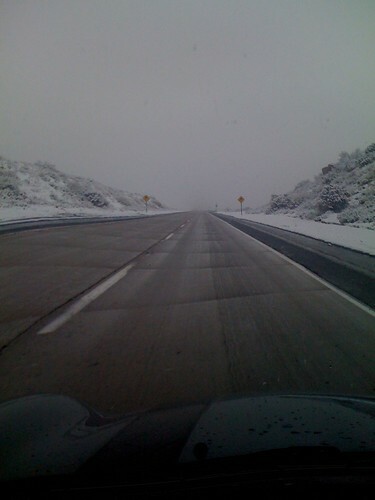 Author adminPosted on April 1, 2010 Categories General1 Comment on This is April in SoCal?